This Spring, Sorbet hit a six-figure SEW milestone by raising over R1 million for its Sorbet Empowering Women (SEW) Academy. 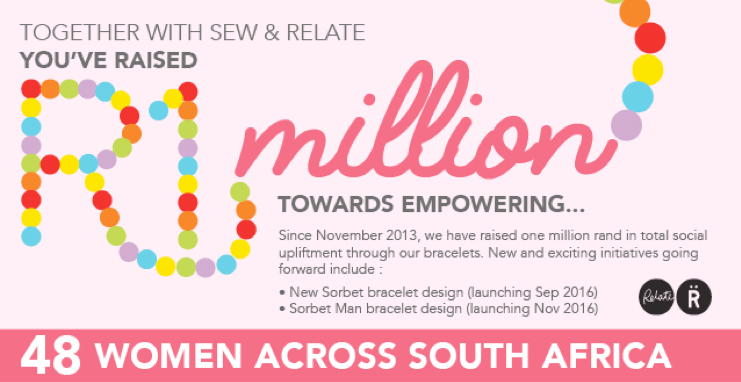 Thanks to the sale of 60,000 Sorbet Empowering Women bracelets sold in Sorbet stores nationwide, over and above additional fundraising initiatives and support from key beneficiaries such as the Jobs Fund, and The Clothing Bank, the R1 million raised for SEW on bracelets has helped to train and provide employment for 53 women. Additionally, according to SEW partner, Relate Bracelets, this has achieved a ripple effect of positively impacting over 350 people, daily. With an estimated cost of R25,000 per graduate course – or the sale of 510 Sorbet Empowering Women bracelets – SEW needs to raise roughly R2.9 million over the next year to make the kind of change they’ve committed to championing. Launched in 2014, SEW began as a way in which for Sorbet to realise a goal that was core to its heart: to be a beauty brand with purpose. For more information on Sorbet Empowering Women visit www.sorbet.co.za or speak with your friendly Sorbet therapist. My favourite Sorbet is the Sun Valley Mall branch – give them a call on 021 785 2767.